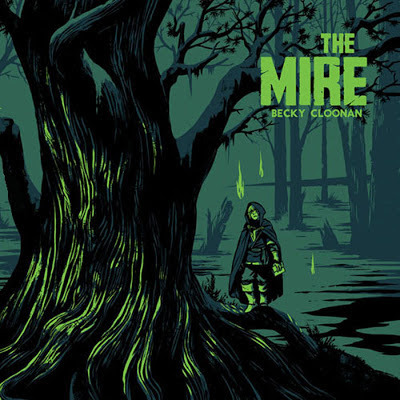 Cloonan has tight rein over the tale she tells through her pacing and her reveals. The Mire may be "no place for a daydreaming boy," but it sure is a playground for craftsmanship, for imagining, for storytelling, and for writing. As with her previous book, Wolves, Cloonan writes a novel in 22 pages of black and white panels thick with her ink and her intent. As with Wolves, in The Mire Cloonan plays with time seamlessly, layering her narrative with shifts from the present to the future – a future looking at the past – a past filled with secrets that are slowly revealed. And really, isn't that the heart of storytelling, this revelation of secrets? Cloonan's secrets are hidden behind thick curtains, enclosed in envelopes sealed with a personal insignia, and dreamed of in the shadows of a fecund Mire. It's all there in the writing. What is all this, then, if not great storytelling? What is all this, then, if not some of the best writing of 2012?